Tom Homer is a versatile back who can play on the wing or at fullback and is also an accomplished goal kicker. Homer joined the London Irish academy in 2008 after going to school at Norman Court in Salisbury and Milton Abbey in Dorchester, during which time he reached the 100m final at the schools' athletics championships. 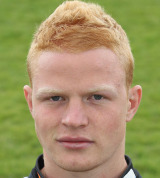 The speedy winger made an immediate impact on his full debut for London Irish in November 2008, scoring two tries against Saracens as an 18-year-old. He went on to score 51 points in 13 appearances in that season. He continued to be an important member of the London Irish first-team squad over the next two season and in December 2010 he signed a new two-year deal with the Exiles. Homer was a regular for England at under-18 and 20 levels and is the all time leading scorer in the IRB Junior World Championships with 118 points.